If you’re thinking California already has a statewide law and a passel of local laws banning single-use plastic bags, you’re right. In 2007, San Francisco became the first city in the nation to ban plastic carry-out bags, and about 150 cities and counties have followed suit, spanning the state from Arcata to San Diego. In 2014, Gov. Jerry Brown signed a statewide ban. So why are we voting again? The plastic bag industry is pushing back. That statewide ban hasn’t taken effect because immediately after it became law, the American Progressive Bag Alliance, an industry group that lobbied against the bill, began collecting signatures to stop it with Proposition 67. Prop. 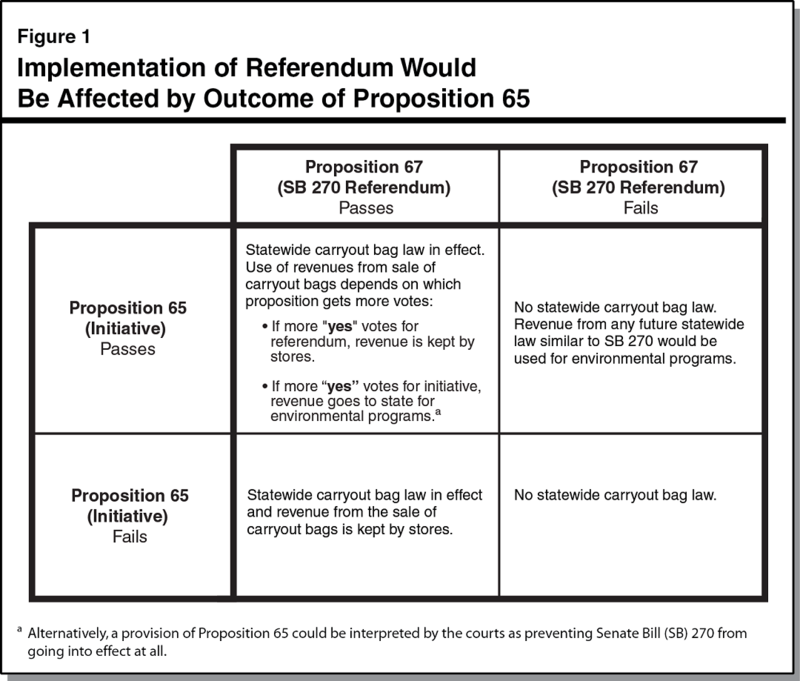 67 doesn’t ask voters whether they want to reject the law. It asks whether they want the law to take effect. A “yes” vote means the statewide ban would become law and take effect the day after the election. A “no” vote means the statewide ban would not take effect, and only local bans would remain in place. Lawmakers passed the bag ban to cut down on the cost of plastic pollution and unify a patchwork of local laws. California taxpayers spend $25 million every year to dispose of 14 billion used plastic bags, according to the Legislative Analyst’s Office, and plastics make up the majority of waste polluting marine habitats off the coast. The California Grocers Association supported the bill, saying there’s a “dizzying array” of local ordinances across the state and the industry needs consistency. The bag industry says the state law jeopardizes manufacturing jobs and enriches corporate grocers through the fees charged for reusable bags. Under the state ban, supermarkets and large drugstores could no longer offer thin plastic carry-out bags and would be required to charge at least a dime for a paper or reusable bag. The 10-cent fee would be waived for low-income folks who pay with a state benefit card. Small grocery stores, convenience stores and liquor stores would have 18 months to comply with the law. Stores could still offer thin plastic bags for bulk goods, produce and other items. The money collected from selling paper or reusable bags could be used only for educational campaigns and the costs of providing bags and complying with the law. However, how the money is used also would depend on what happens with the other industry-back measure, Proposition 65. That measure wants to direct the funds in a different direction.